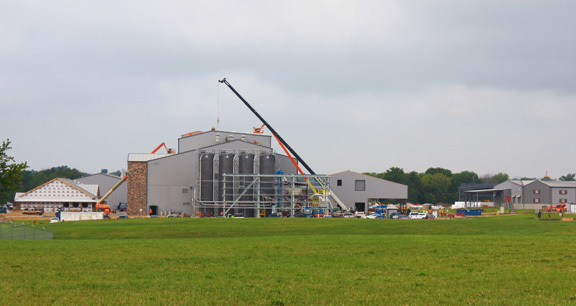 Project obstacles and solutions: As a result of the growth in the bourbon industry, Diageo PLC announced in 2014 that it would invest $115 million to build a new bourbon distillery and aging facility in Shelbyville, Kentucky. The Bulleit Distillery sits on 300 acres. The early work on the site has included the distillery, including a tank farm - an intricate storage system that holds processed ingredients. The site also includes five aging/storage warehouses and an administration building. When fully functioning, the warehouses will be expanded to include up to 15 buildings on the site. Whiting Turner was the general contractor for this project. A number of concrete finishers worked the project, including East and Westbrook who poured the footings, walls and the exterior flatwork; KCI who did the concrete work on the Tank Farm; and Fricke Management who poured the slab for the administration building and also worked on the Tank Farm. There are some unusual aspects of a working distillery, especially one in the midst of the Bourbon Trail in Kentucky. On one hand, it is a functioning manufacturing site, complete with processing equipment and large rolling machinery. At the same time, distilleries have become tourist attractions. Warehouses have to be both working sites and aesthetically appealing. This impacted the concrete used in this project. Warehouse floors had to be flat and level to handle the rows of stacked barrels of aging whiskey. At the same time, the floors of the warehouses were polished to a high gloss. The walls of the warehouse were poured using a cut block pattern. This was also used on the walls surrounding the warehouse docks. All of this calls for a concrete supplier and sub-contractors who know how to finish concrete correctly. Another concrete supplier had started this project, but problems occurred with the consistency of slump and air content of their concrete. IMI was called in to be the new supplier. IMI QC/QA met with Whiting Turner and the site engineers to discuss the demands of the concrete design. They were able to provide consistent concrete that met specifications, including strength, air content, slump, and set times. IMI supplied 15,000 yards of concrete for this project. The warehouses began storing barrels of bourbon in June 2016. The distillery will be operational by October 2016. For more information on pouring concrete in unique industrial settings, contact the sales representative for the concrete plant nearest your location. Click here.